NOTE: The key provisions of SB-270 are outlined below. These key provisions are taken from the language of SB-270 as much as possible but have been changed and modified for clarity and readability. Readers are referred to the actual legislation at: SB-270 (Padilla). On or after 1 July 2015, a store may only sell or distribute a reusable grocery bag to a customer that is made by a producer who has certified to the State of California that the reusable bag meets all the following requirements: (1) has a handle and is designed for at least 125 uses; (2) has a volume of at least 15 liters; (3) is machine washable or made from a material that can be cleaned and disinfected; (4) has a label with the name of the manufacturer, the country of manufacture, and recycling information. A reusable bag made from plastic film (e.g. a thick plastic carryout bag) shall contain at least 20% post-consumer recycled material after January 1, 2016 and 40% recycled content after January 1, 2020. The bag shall be at least 2.25 mils thick and shall be capable of carrying 22 lbs. over a distance of 175 feet for a minimum of 125 uses. The bag shall be recyclable in the state and accepted for recycling via the at-store recycling program. A reusable grocery bag made from compostable plastic film is not required to meet the requirements for post-consumer recycled material, but shall be labeled in accordance with the applicable state law regarding compostable plastics. On and after July 1, 2016, a reusable grocery bag that is not made of plastic film and that is made from any other natural or synthetic fabric, including, but not limited to, woven or nonwoven nylon, polypropylene, polyethylene-terephthalate, or Tyvek, shall satisfy all of the following: (1) It shall be sewn; (2) It shall be capable of carrying 22 pounds over a distance of 175 feet for a minimum of 125 uses; (3) It shall have a minimum fabric weight of at least 80 grams per square meter. A producer of reusable grocery bags made from plastic film shall not sell or distribute a reusable grocery bag in this state unless the producer is certified by a third-party certification entity and the producer has provided proof of certification to the state demonstrating that the reusable grocery bags produced comply with the provisions of SB-270. The proof of certification shall include all of the following: (a) Names, locations, and contact information of all suppliers of postconsumer recycled material; (b) Quantity and dates of postconsumer recycled material purchases by the reusable grocery bag producer; (c) How the postconsumer recycled material is obtained; (d) Information demonstrating that the postconsumer recycled material is cleaned using appropriate washing equipment. A reusable grocery bag producer shall resubmit to the state proof of certification on a biennial basis. A reusable grocery bag producer shall also provide the state with an updated proof of certification conducted by a third-party certification entity if any modifications that are not solely aesthetic are made to a previously certified reusable bag. A third-party certification entity shall be an independent-accredited (ISO IEC 17025) laboratory. A third-party certification entity shall certify that the producer’s reusable grocery bags meet the requirements of SB-270. 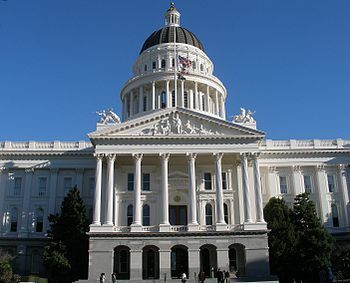 The State of California shall establish an administrative certification fee schedule that will generate fee revenues sufficient to cover-but not exceed the reasonable costs to implement the state certification process. A reusable grocery bag producer shall submit applicable certified test results to the state confirming that the reusable grocery bag meets the requirements of SB-270 for each type of reusable grocery bag that is manufactured, imported, sold, or distributed in the state and provided to a store for sale or distribution. In addition, the producer shall submit the established certification fee when providing proof of certification or recertification. A store “that makes reusable grocery bags or recycled paper bags available for purchase at the point of sale shall provide a reusable grocery bag or a recycled paper bag at no cost at the point of sale to a customer using a payment card or voucher issued by the California Special Supplemental Food Program for Women, Infants, and Children” (i.e. WIC) or an electronic benefit transfer card issued pursuant to the Welfare and Institutions Code (i.e. Food Stamp Program). All moneys collected from the sale of paper or reusable bags shall be retained by the store and may be used only for the following purposes: (a) Costs associated with complying with the requirements of this article; (b) Actual costs of providing recycled paper bags or reusable grocery bags; (c) Costs associated with a store’s educational materials or educational campaign encouraging the use of reusable grocery bags. A city, a county, or the state may impose civil liability on a person or entity that knowingly violated this chapter, or reasonably should have known that it violated this chapter, in the amount of one thousand dollars ($1,000) per day for the first violation of this chapter, two thousand dollars ($2,000) per day for the second violation, and five thousand dollars ($5,000) per day for the third and subsequent violations. A city or county that has adopted , before 1 September 2014, an ordinance, resolution, regulation, or rule relating to reusable grocery bags, single-use carryout bags, or recycled paper bags may continue to enforce and implement that ordinance, resolution, regulation or rule that was in effect before that date. Any amendments to that ordinance, resolution, regulation, or rule on or after January 1, 2015 shall not be enforced except the public agency may adopt or amend an ordinance, resolution, regulation, or rule to increase the amount that a store shall charge with regard to a recycled paper bag, compostable bag, or reusable grocery bag to be no less than the amount specified in SB-270 (i.e. 10-cents). Proponents of plastic bag bans have repeatedly argued that the recycling rate of plastic carryout bags via the At-Store Recycling Program is only 3% and therefore that plastic carryout bags should be banned. SB-270 continues this so-called “failed” At-Store Recycling Program for paper, plastic, and reusable bags. Our contention has always been that the low recycling rate for plastic carryout bags through the At-Store Recycling program is directly attributed to the fact that the majority of plastic bags are reused by consumers as trash bags and for a myriad of other purposes. See our article Plastic Bag Recycling Rate – A Non-Issue. Reusable grocery bags sold by stores in the State of California must be tested and certified on a biennial basis by an independent third party laboratory that the reusable bags manufactured meets the requirements of SB-270. The certification must be submitted along with a certification fee to the state. The certification process is an added expense for reusable bag producers and will do little to protect the consumer. The only potential benefit is that testing will demonstrate the absence of toxic amounts of lead, cadmium, and other heavy metals from imported reusable bags. Years ago, several major chains had to recall reusable bags issued due to the presence of toxic amounts of heavy metals. According to SB-270 a minimum fee of 10-cents for paper and reusable bags is established to ensure that customers who bring and use their own bags do not subsidize the cost of paper and reusable bags sold or given free of charge to other customers. While one might agree that this is a noteworthy goal, it means that the legislature intends customers who pay for paper or reusable bags subsidize the bags provided free of charge to participants in the WIC and food stamp programs. Also, if there are not enough customers who pay for paper and reusable bags, who then will pay for the bags provided at no cost to WIC and Food Stamp participants? Don’t you think the stores will pass the cost of free bags to all customers in the form of higher prices? Of course they will. This goal is nothing more than “pie-in-the-sky” and unenforceable. See our article: Plastic Bag Ban Creates New Welfare Benefit. SB-270 requires that both paper and thick plastic reusable bags have post-consumer recycled content in order to create a market for recycled paper, and plastic. While this goal sounds good, it is more pie-in-the-sky because by charging a minimum fee of 10-cents for each paper or thick plastic reusable bag issued, will limit the number of bags sold and the impact on the market for recycled material will be negligible. Had SB-270 allowed for the free distribution of paper and thick plastic bags, the impact on the market for recycled paper and plastic would have been much greater. In the past, when shoppers received “free” plastic carryout bags, only about 3% of such bags were recycled via the At-Store Recycling Bin. Most shoppers reused those free bags as trash bags or for some other purpose instead of recycling those bags. SB-270 along with local carryout bag ordinances requires shoppers to pay a minimum of 10-cents for each paper or thick plastic reusable bag issued. The question becomes, once a shopper pays 10-cents for a paper or thick plastic bag, will the monetary investment in that product change shopper behavior with respect to putting that bag in a recycling bin? Or will the shopper find an alternative use for that bag? SB-270 does not address if the 10-cent fee for paper and reusable bags is subject to the sales tax. Under current State of California guidelines, the paper bag fee is exempt from sales tax (unlike other states) in order to avoid the limitations of Proposition 26 which requires a vote of the people to raise taxes. For more information see our paper: “Paper Bag Fee Setting A Bad Precedent”. SB-270 does not guarantee that a thick plastic carryout bag or paper bags are reused. In other words, a thin film single use carryout bag is replaced by a thick film single use carryout bag that is called reusable only because it is 2.25 mils thick. The state of California could simply have banned thin film plastic carryout bags in favor of thick film plastic carryout bags which would have been much simpler to do than the current legislation. The thick plastic carryout bag does not become windblown litter like the thin-film bag. For more information please see out paper: “Plastic Bag Bans – A Community Could Do So Much Better & For So Much Less”. The clause requiring that all monies received be used for certain purposes is very suspect. A paper bag typically costs the store about 5 cents. Now, they will collect a minimum of 10-cents for it. That is at least 100% profit. While some of the money will be used to provide free paper and reusable bags to WIC and food stamp participants, how much of the remaining money can you really use to educate shoppers with the “bring your own bag” propaganda as required by the law? So a store prints up a few signs and puts them in the parking lot to remind you to bring your reusable bags and also adds a reminder in their weekly flyer. What then is done with the remaining profit from the paper and reusable bag sales? Who will audit stores to ensure that all monies collected for paper and reusable bag fees are used solely for the purposes identified in SB-270 and that no additional profit that goes back to the store? SB-270 also fails to require that reusable bags be made from materials that are locally recyclable. Therefore, most reusable bags will end up in the landfill at end of life rather than be recycled. For more information, see our article: “Fact Sheet Landfill Impacts LASBVTA”. SB-270 is clearly the wrong solution for California. SB-270 will cost California residents more than a $ 1 billion per year (see our article: “Statewide Bag Ban Will Cost Residents $1 Billion”) and create an unnecessary and costly regulatory structure. The state could have done much better, had it just required that plastic grocery bags meet the 2.25 mil thickness requirement (so they don’t become windblown litter when improperly discarded) and allowed for the free distribution of paper and plastic bags. Californians would then still have the freedom to be able to choose which type of bag to take their groceries home in and would eliminate a lot of frustration with using reusable bags. (See our article: “Using Reusable Bags Not That Easy”) In addition the state would also have avoided increased water and energy use to wash and sanitize reusable bags. But instead, the state is taking money out of your pocket and giving it to others.